Last weekend contained a day of extreme excitement, and to be frank excruciating boredom! Sunday the 23rd of May was the day of the Cameo Auction of Angel Costumes that I gave a heads-up about a little while back. I did think it was an unusual marriage, especially given Angels’ long association with Bonhams in Knightsbridge, where they have held a number of sales which have included Who-related items. Cameo Auctioneers are somewhat out of central London, beyond Windsor and Reading (see map above) and are really one on the many regional auction houses around the country making their way selling the contents of house clearances and the like. Credit to them though, they have also been home to a number of memorabilia sales with items relating to The Beatles and the like. They have also broadened their audience by running their auctions live on the net. Being a good 90 minutes drive we decided to go to the viewing on the day of the sale rather than making two trips. The sale was due to start at 11am and we got there in plenty of time with the intention of seeing the Peter Davison waistcoat from Planet Of Fire and getting some decent reference pictures. It was really the one item in the sale I had serious intentions of bidding on, but I wanted to make sure I was covered in case I didn’t win. While I was getting my photos (see left) someone asked if I was from that Tennant Coat website – oops! I’ve been spotted! We had a chat and it ended up to be Jamie Smythe, who runs the DoctorWhoProps website. I went to the front office to get a catalogue (see right) which was free. It certainly wasn’t the bound glossy catalogues you get at Bonhams, and was just a black text un-illustrated A5 booklet of listings, with a colour cover. To my minor horror the one item I wanted to bid on was on the cover! Drat! Anyway, we got a coffee and patiently waited for the auction to start. 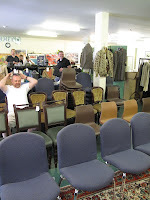 Hardly anyone seemed to be around, and any expectation of a rush of bidders arriving at the last minute evaporated when the auctioneer called order and made a start on selling the lots. I glanced around and counted (including myself) barely a dozen people in the room, most of whom hovered around the edges (see left, picture taken while auction was in full flow!). They may have over-estimated on the seating needed! To be fair it was a Sunday – 11am – an a lovely hot, sunny day. The wasitcoat was lot 149, and since I didn’t know how the bidding could run away with it, so I held off bidding on anything else. During the course of the sale a number of items worn by some big star names were either sold for trivial prices or failed to sell at all. 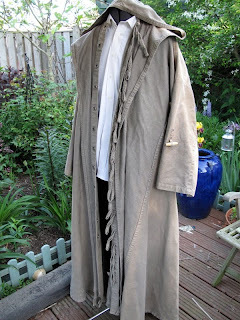 Nigel Bruce (his costume as Dr Watson in the Rathbone Sherlock Holmes films); Peter Lorre; Anthony Quinn (costumes from Lawrence Of Arabia); Ralph Fiennes (from Schindler’s List) all failed to find a buyer. 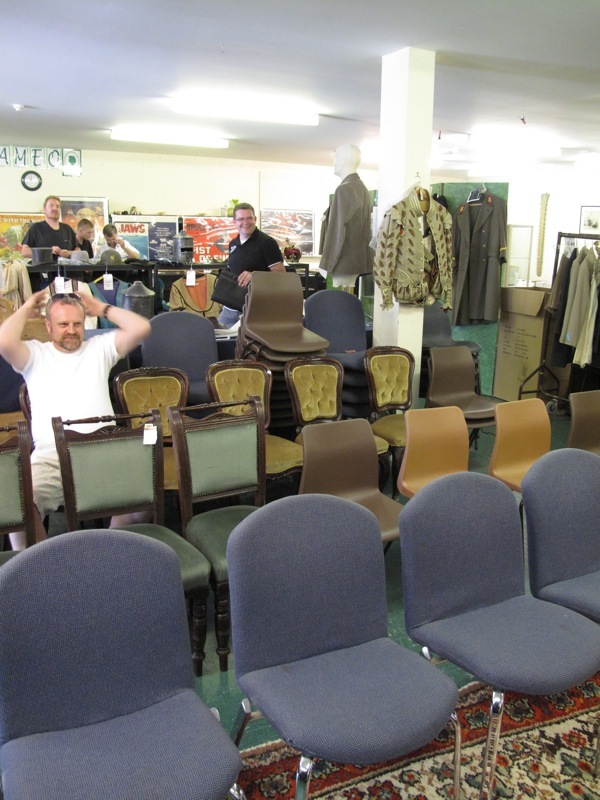 A good half hour passed and barely 20 lots had been gotten though – this was gonna be a loooong auction! Along the way I was tempted by a set of garters worn by Gert Frobe as Baron von Bombhurst in Chitty Chitty Bang Bang, one of my favorite films of my childhood! They had an estimate of £100 to £200 and I got them for £50. Bargain! They’ll look nice framed with a photo from the film. 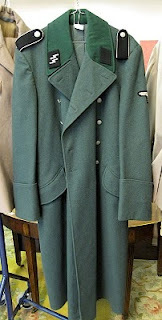 Another item which caught my eye, but for a different reason, was a green army greatcoat which had apparently appeared in Indiana Jones and The Last Crusade. (see left) It was identical in every respect to a coat I bought at the Angel Retro Sale back in February (see below). 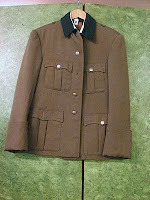 Mine does not have the nazi emblems on it, but everything else, right down to the buttons was exactly the same. My initial internet searches showed that North Korea has green army greatcoats, so I had thought it may have appeared in Die Another Day. But it would be nice to think it was actually from an Indiana Jones film! A leading auction house this was not! 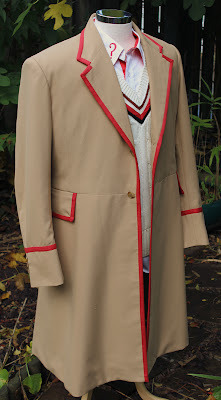 So, after more than 140 lots we finally reached the six Doctor Who items. First up was lot 144, Tom Baker’s shoes. Bidding was a little slow to start but quickly picked up and they went for £300 to a telephone bidder, nicely at the upper end of the estimate of £200 to £300. 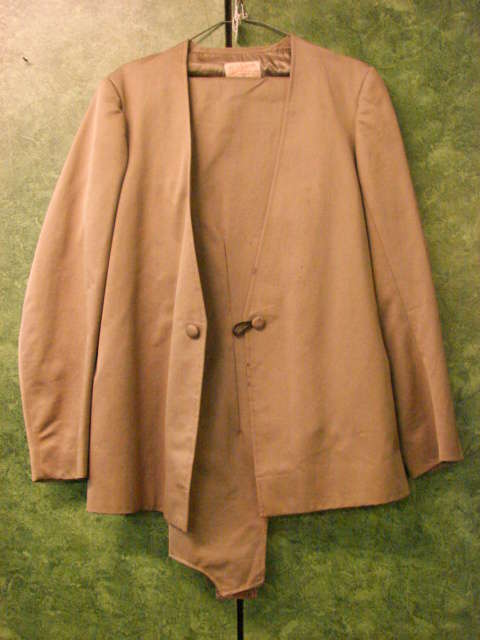 Next, lot 145 a beige suit worn by James Maxwell in Underworld failed to sell. Then came lot 146, Jean Marsh’s shimmering full length dress worn as Morgaine in Battlefield. 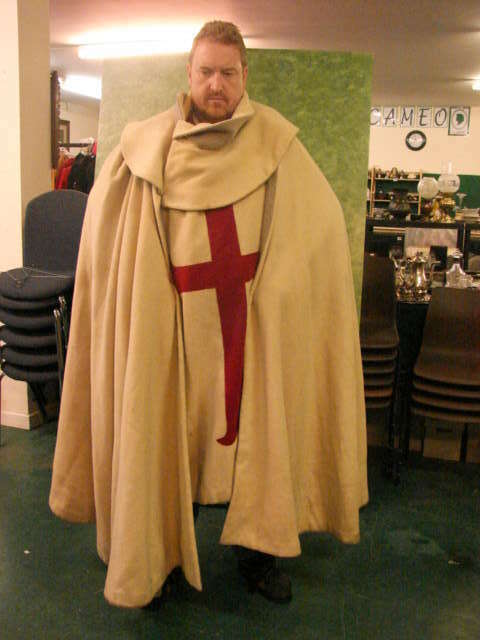 Lot 147 was a Crusading Knight’s cape from The Crusade. 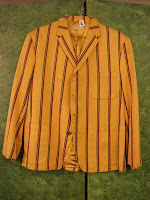 Lot 148, A yellow striped holiday camp style jacket from Delta and the Bannermen. 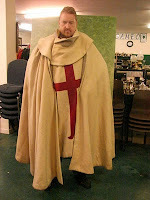 In June 2010 it was resold on eBay for £250. Then came the final Who item, lot 149: the waistcoat worn by Peter Davison in Planet of Fire (see left). This was the one item I had designs on bidding on and with an estimate of £800 to £1,200 I was prepared for some competitive bidding. The auctioneer started it relatively low, around £700 I think, and there was some online bidding against another buyer at the back of the room. This levelled out at around the £800 mark, the lower end of the estimate. As he started to call fair warning, I entered the bidding and found myself in a war with the bidder at the back of the room. It slowly crept onward and upward and was soon at the upper £900 mark and was offered back to me at £1,000. Biting the bullet I went for it, hoping it would not go much higher into a four-figure sum, but to my surpriser that was it – I guess my rival had set a £1,000 limit and was not prepared to go over it. Fair warning was called and the hammer came down. Only when I was asked my number was I satisfied I got it, as the auctioneer had reopened bidding a number of times after dropping the hammer. This time he didn’t - and it was mine! After ducking outside for a bit of air and to take in that I had won, I did return to see how one further lot would go. I had my eye on a long canvas coat that had been used in Alien 3. I wasn’t expecting much from it, but when I found it at the viewing I thought it was in very good condition with little wear. It had an estimate of £200 to £400, and I would be up for it if I could get it for £200 or less. The bidding opened for it a bit below the estimate and there were no takers. It dropped to £100, then to £50, at which point a bidder stepped in. After a couple of online bids it settled at £150 and I bid in at £160 and got it – so nicely within my budget. 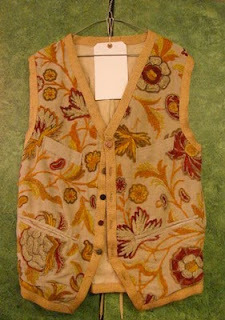 So, as good result with me securing the one item I wanted, plus nabbing a couple of bonus items at a knock-downn price. I did later re-contact the auction house and bought one further item. A jacket worn by Ralph Fiennes in Schindler’s List had failed to sell, and had been offered as low as £100. 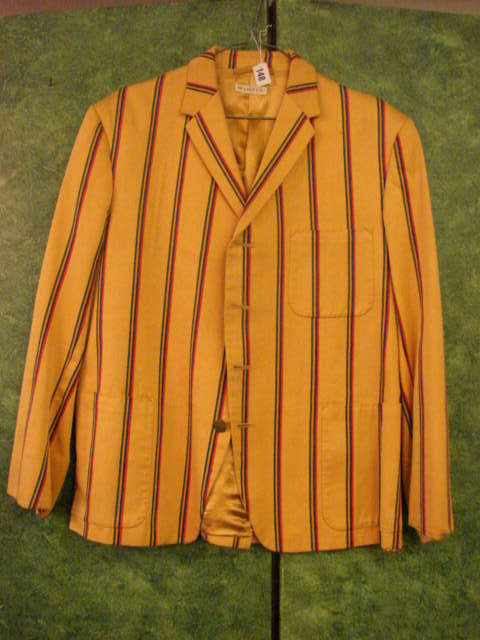 Another identical jacket had sold at Bonhams for £600, so I grabbed that too with a view to selling it on at a future sale. 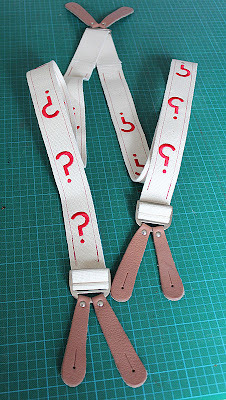 And to think, how mad is it that you can lay claim to Baron Bombhurst garters! I do believe his little choochy face will disapprove of such a thing. Once again though, well done on the Davison front. I can only begin to imagine how useful having that would be rather than relying on your pictures! Sorry for the delete above - mistype. 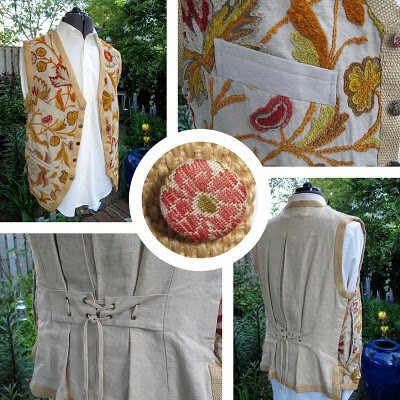 I meant to say the vest looks great and I am so glad it is in good hands.